The Qioptiq group has a new leader, with Mr Fredrick Arp being appointed as chairman and CEO on 8 January 2010, bringing with him a vision to align the group’s activities and further establish Qioptiq as a group providing innovative photonics solutions to its customers around the world. After several years of working as an international network of companies, in 2010, the Qioptiq Group’s 2,300 people across North America, Europe and Asia will begin working even more closely together under one name and one logo. Qioptiq is your global one stop source for Photonic Solutions. Within the Defence & Aerospace Division, Vice President David Marks is focussed on maintaining a steady pace of development within the Dismounted Close Combat / Soldier Modernisation market sector in order to ensure that Qioptiq products remain state of the art and provide features and capabilities called for by the User community. The Defence & Aerospace Division provides an excellent balance of Technology, Engineering and Manufacturing capabilities that can provide world leading DCC products with both reliability and affordability. Moving forward with a fresh new look, the company is exited about expanding its product portfolio and getting to grips with some of the fundamental questions challenging the ISTAR community, in particular the “Fusion Beast”. We will be unveiling two new Thermal Weaponsight Products at the Soldier Technology Show in London this year – the Soldier Technology Show is the ideal forum for product launch as is brings together an extensive array of Soldier Modernisation and Dismounted Close Combat experts, stakeholders and most importantly, Users. DRAGON Compact is the first of our new fleet to be unveiled. DRAGON C is our latest, lightweight, multi-use thermal weapon/observation sight targeted for Dismounted Close Combat & Special forces users. Weighing a mere 430g, and utilising a 320x240 25u uncooled thermal core, DRAGON C has been developed with lightweight and low power in mind right from the start. Power is provided by 2AA batteries (that provide a run time of approximately 5 hours), with an overall power consumption of less than 1.5W. At all times throughout the design process, size, weight & power have been traded carefully against performance and cost to ensure that right balance of capability can be provided from the sight. We’ve learned a number of things from the VIPIR2 fleet and poured our lessons learned into the DRAGON family. An example of this is that we are now using the Emagin OLED Rev3 which offers lower power and longer run time that its Rev2 predecessor (and is totally backwards compatible). 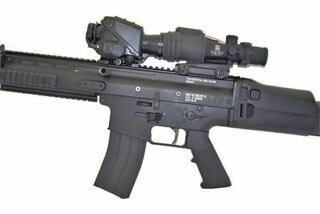 DRAGON C is primarily designed to be used as an in line “Clip On” thermal weapon sight, therefore allowing the User to retain his existing day sight on the weapon. Weapon zero is unaffected due to the X1 collimated optical design of the DRAGON C unit. The design has been optimised to work with a number of popular optical day sights from international manufacturers and will operate nicely around the X2-X4 magnification region making it well suited for Personal Defence Weapons (PDW’s), and Assault Rifles / Carbines. One area of significant design focus has been boresight stability (the ability for the DRAGON C to remain stable under gunfire shock and temperature drift) as this is a crucial area often overlooked for clip on sights. Also the alignment of the input image to the output image is critical to ensure that the Mean Point of Aim (MPI) doesn’t move when the User mounts the sight unit in front of his day sight. Whilst it’s primary role is an in line “clip on” thermal imager, DRAGON C is equally at home being used as a stand alone lightweight thermal weapon sight. Providing Magnification settings of X1, X2 (achieved via E-Zoom), along with on board aiming mark selection & zeroing capability. This role is particularly well suited to PDW users, who have limited space on top of the weapon system to use an in line type set up. Due to its lightweight and compact size, DRAGON C is also very useful as a hand held Thermal Surveillance Scope that can easily be stored in a pouch or pocket when not in use. With a range performance of approximately 400-600m to detect a man sized target, DRAGON C is a truly versatile all rounder that opens up a fresh new chapter in the history of Qioptiq Dismounted Close Combat equipment development and we are extremely proud of the outcome. DRAGON C is the first of the new family to be unveiled and deliberately so due to the increasing demands from the User community for reduced weight, improved integration and appropriate capability. We believe the DRAGON C delivers a well traded balance of size, weight, power and performance at a very affordable price. Also being shown for the first time at an International show is the DRAGON Long Range (LR) Thermal Weapon Sight. DRAGON LR represents the other end of the spectrum from the DRAGON C, yet the sights share many features and architecture elements that bring them together as part of the overall DRAGON family. DRAGON LR utilises a 640x480 25u uncooled thermal core coupled with a 9 degree field of view lens to provide a long range DRI capability. With Detection of man sized targets at ranges in excess of 3km, the LR is primarily aimed at section level & heavy support weapons looking to operate out past the 2km range mark. Yet, with an overall weight of less than 1400g, the DRAGON LR presents a lightweight solution for its role. DRAGON LR has a base system magnification of X2.7 (with X5.4 / X10.8 available via E-Zoom). The DRAGON LR bears a striking resemblance to the UK FIST Projects FTS (FIST Thermal Sight) that was also developed by Qioptiq, in conjunction with the THALES FIST PCMO and the DSS PT / ITDU, and this is no accident. The system architecture and Man Machine Interface (MMI) of the DRAGON family are directly compatible and interchangeable, therefore reducing burdens on training and Supportability due to variants sharing common modules and Line Replaceable Units (LRU’s). 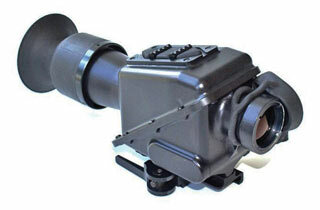 An Infra Red Laser Aimer can be integrated, along with the ability to fully control the sight from a remote location (such as the weapon handguard / softmount etc) via the use of full I/O capability. So What’s in the Middle? We can expect to be unveiling a wider range of DRAGON variants in due course, each one targeted at providing a natural successive capability to our existing VIPIR2 fleet, but with reduced Size, Weight and Power, and additional future proofing features such as digital video and C4I hubs to allow integration into the wider section, platoon and company systems. The Image Intensifier hasn’t been forgotten. The MERLIN family of in line Night Vision Sights is also being launched at the Soldier Technology show. MERLIN comprises of 3 variants aimed at the Assault Rifle, Sharpshooter Rifle and Sniper Rifle Users, so named Short Range (SR), Medium Range (MR) and Long Range (LR), the MERLIN units provide different size / weight / performance trades, all offering simplistic MMI, common accessories and a power supply of 1 standard AA battery. As with the DRAGON C product, the main effort in the design of the MERLIN family has been to deliver a system capable of retaining boresight even when subjected to the harsh shock impacts produced by modern 5.56, 7.62 and 8.39 mm rifles, for single shot, semi and full automatic firing modes. So with a static boresight retention of less than 0.5MoA, MERLIN is poised to deliver accurate results to Users who require the flexibility of a modular sighting system approach. The MERLIN family will sit alongside the existing KITE family of stand alone Image Intensified Weapon Sights to provide a greater choice for the customer wanting reliable, robust weapon sight solutions. We can expect the new developments from Qioptiq to continue throughout 2010 and into 2011. The whole sensor fusion debate is now more appropriate than ever, given that a number of nations, projects and manufacturers have developed and deployed prototypes, pre production, and even in some cases, production solutions that deliver capability across more than one waveband. Having learnt a great deal during the past six years since the TIDI (Thermal Imager Dismounted Infantry) Technology Demonstration Project, and the launch / entry into service of the VIPIR2 fleet, which provided invaluable operational feedback; technology developments and manufacturing process developments means that we can now move forward to deliver greater capability in lighter, smaller packages. The DRAGON and MERLIN families are clear examples of this, however the inherent technologies we require to enable vision in the various wavebands are now significantly lighter weight, lower power and more flexible than they were even three years ago. The recent developments claimed in digital night vision and SWIR technologies also throw new variables into the mix. The 2010 – 2015 timeframe will no doubt prove to be extremely exiting and may even allow us to realise the aspirations of Industry & User communities that have been sought going back as far as the late 90’s and early 2000’s when integrated and fused sights were first discussed. The Re-Organisation of the Qioptiq Group worldwide has provided for further focus on its Research & Development activity in order to ensure that the novel approaches, concepts and technologies can be exploited and transitioned through the Technology Readiness Levels efficiently in order to deliver deployable solutions in a timely manner. For the past few years we have focussed on our strength as an operations base manufacturer, which is an understandable position given that we have been heavily involved in supplying and supporting equipment capability to our front line service men and women currently engaged on operations in Afghanistan, however we are now ensuring that we capitalise on valuable experience gained and developments in technology to ensure that our equipment remains world class for the years to come. The development of the DRAGON family of Thermal Weapon Sights and the MERLIN family of Image Intensifiers are examples of this, and we expect more to come throughout the year. The requirement for sensor fusion, a true 24hr sighting solution still stands firm in the eyes of Users around the world, and we are steering closer to this becoming a reality as the enabling technologies become more compact and lighter weight. This could be a reality within the next 2-3 years. Industrial Partnerships and International Organisations. Whilst Qioptiq is a worldwide organisation we also recognise that some nations wish to promote their own national industry capability and have a preference for encouraging local added production value for larger procurement contracts. The Qioptiq approach is to embrace this culture and form industrial partnerships where required. This open approach has lead to large contract success, with a number of potential collaborations ongoing around the world. Qioptiq is always on the lookout for opportunities to collaborate and partner with industrial players around the world in order to bring world class capability to national programmes. Qioptiq, along with our industry partners are totally committed to reducing the weight and burden of our ultimate customers – the end users of our nations that are tasked with undertaking dangerous operations in harsh environments. Hopefully as you have read through this short article you have captured the spirit of what we are about - that is providing the best we can within the realistic constraints of technology and availability. 2010 is shaping up to be an extremely busy and challenging year for Qioptiq and we will continue to push forward and challenge the boundaries. Qioptiq designs and manufactures photonic products and solutions that serve a wide range of markets and applications in the areas of defence and aerospace industrial manufacturing, medical and life sciences, as well as research and development. The company is known for its high-quality standard components, products and instruments, its custom modules and assemblies, its leading-edge innovation, its precision manufacturing and its responsive global resourcing. Through a series of acquisitions, Qioptiq has an impressive history and pedigree, and benefits from having integrated the knowledge and experience of LINOS, Point Source, Spindler & Hoyer, Gsänger, Optem, Pilkingtons, and others.